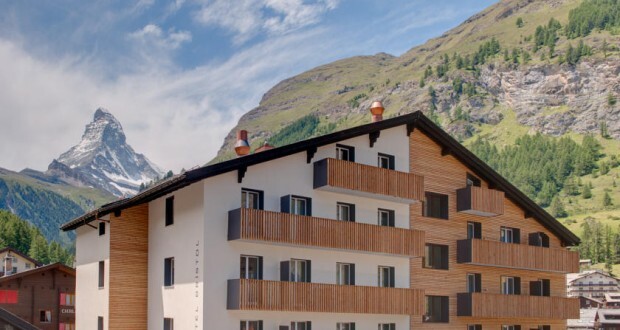 The family-run Bristol hotel is in a central yet quiet location in Zermatt, between the train station and the Klein Matterhorn cable car. It includes a spa area and provides free Wi-Fi in all areas. Most rooms at the Hotel Bristol offer superb views of the Matterhorn. The half board rate includes breakfast and a 5-course dinner. All winter sports facilities and cable cars can be reached easily by foot. You can rent or buy skis on site and tickets for the elevators and cable cars are sold at the front desk. The ski bus stops right in front of the Bristol hotel. You can relax in the cozy bar, in the sauna, the whirlpool or in the steam bath. The large terrace with deckchairs invites you to enjoy the sun. A playroom and an internet corner are available for free.